Set out on a 7-day tour of the Canadian Rocky Mountain National Parks departing from Seattle. Take an optional canoe trip on Lake Louise, explore Banff, Jasper and Yoho National Parks and get a glimpse of Mt Robson. Visit Whistler, Vancouver and Clearwater on this tour through Western Canada’s awe-inspiring scenery. Marvel at the stunning scenery, including alpine lakes, waterfalls, giant glaciers and jagged Rocky Mountain’s towering above you at every turn. This small-group tour, max. 14 passengers, offers wildlife spotting opportunities and includes the option of camping or lodging accommodations and optional tour excursions. Includes National Park fees. Day 1 - Seattle to Kamloops: Your first day begins from Seattle going to Kamloops British Columbia. Kamloops is abundant with stunning scenery and great wildlife viewing. Cougars, bears elk and more inhabit the area. En route stop for a short walk and picnic at Bridal Veil Falls Provincial Park. Bridal Veil Falls, which tumbles 197 ft. over a smooth rock face, creating a veil-like effect. Day 2 - Yoho National Park: Explore trials around the magnificent Emerald Lake where you can take a walk around the lake or simply relax in the lakeshore cafe and enjoy the views. This afternoon you'll drive the Kicking Horse Pass across the Continental Divide into Alberta. Enjoy panoramic vistas of peaks exceeding 10,000 feet on Rogers Pass at the summit in Canada’s Glacier National Park en route to Banff for an overnight stay. Banff is a fun mountain town offering some alpine nightlife and numerous cafes and restaurants. 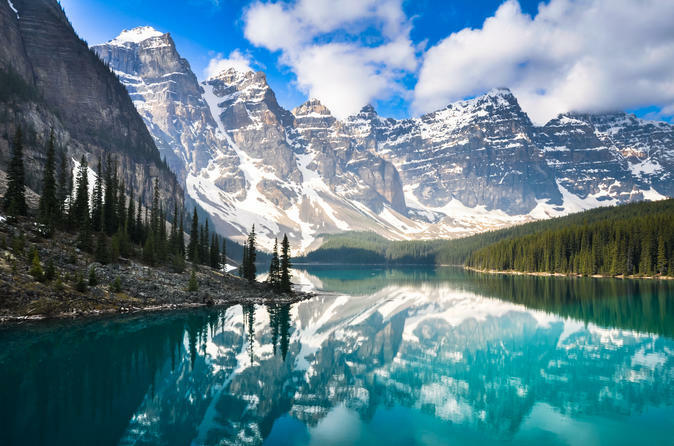 Day 3 - Banff National Park to Lake Louise: Lake Louise is an alpine lake known for its stunning turquoise glacier fed waters ringed by high peaks and overlooked by a stately chateau. Multiple hiking trails lead up to the Lake Agnes Tea House for bird's-eye views of the lake. Take a hike to the Plain-of-Six-Glaciers or canoe on these pristine waters. This afternoon visit Moraine Lake in the Valley of the Ten Peaks, at an elevation of approximately 6,183 feet for some epic photos. Day 4 - Icefields Parkway Jasper National Park: Spend the day driving and exploring the Icefields Parkway offerng endless vistas, jagged mountains, glaciers and wildlife viewing opportunities. These are truly one of the world's most spectacular drives. Enjoy short walks, views of Bow Glacier and Peyto Lake, take an optional helicopter flight over the Icefields or a glacier walk. Day 5 - Jasper National Park: With snowcapped summits and beautiful lakes, Jasper offers an abundance of wildlife, Miette hot springs, alpine lakes and numerous hiking and biking opportunities. Sit back as your driver follows the Yellowhead Highway to Cleawater via Mount Robson (the highest point in the Canadian Rockies). Day 6 - Whistler and Vancouver: Nestled at the base of Whistler and Blackcomb Mountains you will have the day free to explore all that Whistler has to offer. Enjoy spectacular scenery and incredible photo opportunities as you explore this cute ski town and home of the 2010 Vancouver Winter Olympics. Later this afternoon drive the spectacular Sea to Sky highway for your evening in Vancouver. Day 7 - Vancouver and Seattle: This morning you'll get to tour Vancouver, including the waterfront, Gaslamp District, Chinatown and Stanley Park. Then head to Seattle for a your evening downtown or drop off at the departure hotel.